Today is the sixty-second anniversary (and the second time we’ve commemorated it here) of the 1953 coup d’etat, carried out by Iranian elements at the behest and with the support of British Secret Intelligence and the US CIA, that forced Iranian Prime Minister Mohammad Mossadegh from office. 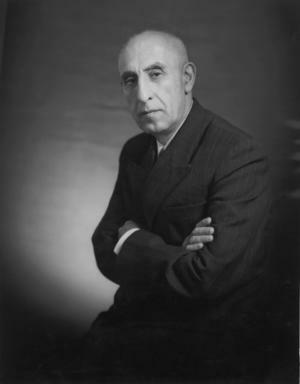 Mossadegh was nominally replaced as prime minister by Iranian general Fazlollah Zahedi, but in reality his replacement was the Shah of Iran, Mohammad Reza Pahlavi, who had ruled Iran more-or-less as a constitutional monarch prior to 1953 but after the coup veered sharply toward despotism. Today actually marks the end of a five day process during which two separate coups had to be attempted; the first attempt, on August 15, failed when Mossadegh (who was ready for it) simply refused to acknowledge the shah’s authority to dismiss him as PM, and began arresting anyone involved in the plot to get rid of him. On August 19, after the CIA had apparently decided to stop its anti-Mossadegh operations due to the failure of the August 15 coup, Zahedi (who had managed to escape arrest to that point) used CIA money to hire people to stage a violent “communist” demonstration that gave Zahedi an excuse to deploy the army in Tehran and arrest everybody, Mossadegh included. I’m reluctant to give the 1953 coup a “today in history” treatment, because those are everywhere and most of them at least get the historical details right. But the real problem with 1953 nowadays is that its mythology is more potent than the historical reality. Mossadegh is portrayed almost as an Iranian Gandhi by people who are looking for a cudgel to beat up on US policy toward Iran. But Mohammad Mossadegh wasn’t an Iranian Gandhi (heck, Gandhi wasn’t even really Gandhi, you know? ); he was a politician and a human being who did some good and some bad. Limiting the powers of the shah was a good idea (especially given what we know of Mohammad Reza Pahlavi in hindsight), and, frankly, the UK left him with no choice but to nationalize Iran’s oil. The Anglo-Iranian Oil Company only paid 16% of its profits to Iran and flat-out reneged on agreements to build new schools and infrastructure there, and to give Iranian employees better opportunities for career advancement; when Mossadegh offered the UK a more than fair 50/50 split of oil profits and they rejected his offer, you could argue pretty convincingly that there was nothing left for him to do but nationalize. Ruling under emergency powers for months on end, as Mossadegh did from mid-1952 on, and then indefinitely dissolving parliament, as he did in early August 1953, were not good ideas (they were certainly not in keeping with Mossadegh’s modern image as a symbol of democratic governance). In truth, Mossadegh’s political support was probably waning as 1953 wore on and Iran’s economy grew weaker (which, admittedly, was partially engineered by London), and as his political coalition began to come apart for a variety of reasons (some of which, again, were engineered by London). He had lost the support, for example, of the influential cleric (and parliament speaker) Ayatollah Abol-Ghasem Kashani, who had been a Mossadegh ally but was angry at Mossadegh’s secularism and his unwillingness to allow Kashani to have a bigger role in governing the country, to the point where Kashani actually went along with the coup. Kashani was one of Ayatollah Khomeini’s mentors, and Khomeini not only opposed Mossadegh in the 1950s, but he also had nothing but nasty things to say about the former PM when people began to evoke Mossadegh’s memory in the aftermath of the 1979 Iranian Revolution. Bear that in mind the next time you hear Khomeini’s successor, Ayatollah Khamenei, complain about America’s role in the 1953 coup. Measuring Mossadegh’s remaining popular support is impossible now, but inside his governing coalition things were starting to get messy before the coup took place. On the other hand, there’s a growing industry on the right that practices in diminishing the 1953 coup entirely. Every once in a while you see pieces arguing, for example, that Mossadegh “was not democratically elected,” when in fact the process by which he became PM was virtually the same process by which prime ministers are selected in plenty of “democratic” countries today. That piece to which I linked there gets bonus points for citing “mass demonstrations” in early 1953 as evidence of Mossadegh’s declining popularity while simultaneously allowing that those demonstrations were probably engineered by British SIS and US CIA agents. Engineered demonstrations aren’t evidence of popular anything, it seems to me. I also appreciate how the fact that Washington didn’t participate in the coup to get its hands on Iran’s oil (that was Britain’s motivation, not America’s) is offered up as evidence against American perfidy, as though anti-Communist paranoia is somehow a nobler excuse to muck around with some other country’s ability to govern itself than oil greed. None of this should be taken to suggest that 1953 doesn’t matter, or that America didn’t make a huge mistake by involving itself in the coup. Indeed, as a historical turning point, this really was a huge event–it was legitimately the last time Iran was governed by something approaching a genuine democracy, and the coup completely destroyed that. America’s involvement turned Mossadegh into a symbol against American interference in Iranian affairs, and washed away whatever failings the real Mossadegh actually had in favor of a narrative that pits his (polished up) memory against the specter of an America that has earned Iranians’ ire over much more than just its involvement in one 62 year old coup. The tale of 1953 is still very powerful both for Iranians and Americans trying to rebuild a relationship between those two countries (or fighting to prevent that from happening), but that tale should be understood as historical shorthand, not real history.